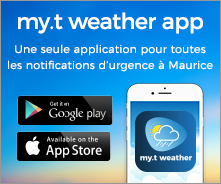 The impacts of climate variability and extreme weather events are becoming a concern to the Republic of Mauritius, including Rodrigues, St Brandon and Agalega. The climate of the South West Indian Ocean (SWIO) small island states is influenced by large ocean-atmosphere interactions such as trade winds. They are often affected by tropical cyclones and other extreme weather. Some of them like the Saint Brandon or the Cargados Carajos Shoals and Agalega Islands are threatened by sea-level rise as well. Though the GHG emission of Mauritius is insignificant, warming of our climate and its effects on our natural and ecological system are unavoidable and already palpable. Analyses of temperature recorded at Mauritius and its outer islands show a definite warming trend. Average temperature at all stations is rising at the rate of 0.15 °C per decade and has risen by 0.74 – 1.2 °C when compared to the 1961-90 long term mean. At some urban stations the temperature has risen by even greater amounts. Similar warming trends have also been observed at the outer islands like Rodrigues, St Brandon and Agalega. The last two of these islands are 1.5 km2 and 70 km2 in area, at about 2 m above mean sea level at their highest point and a variable population of less than 100. The temperature at Agalega is rising at the rate 0.11 °C per decade with an average rise of 0.62 °C during the last ten years when compared with the 1961-90 mean. Temperature at St Brandon and Rodrigues has warmed up by 0.5 – 1.0 °C. IPCC 2007 report concludes that average ocean temperature from surface to a depth of 700 meters has warmed up, though land surface temperature has increased more than ocean water temperature. Sea levels in the southwest Indian Ocean based on reconstructed tide gauge data and Topex/Poseiden altimeter for the period 1950-2001 shows a rise of around 1.5 mm/yr at Port Louis and 1.3 mm/yr at Rodrigues, (Church, et al., 2006). Analysis of Port Louis data for the period 1987-2007 gives a mean rise of 2.1 mm/yr for the last 10 years. This slightly higher rise is consistent with IPCC WGII AR4 conclusions, although longer period of measurements are necessary for reliable conclusions. Warming of the atmosphere has also impacted the hydrologic cycle over the southwest Indian Ocean. Long-term time series of rainfall amount over the past century (1905 to 2007) show a decreasing trend in annual rainfall over Mauritius. In fact the average rate of decrease per decade is around 57 mm. The total decrease during the last ten years is about 8% when compared to the 1950s. A lengthening of the intermediate dry season, the transition period between winter and summer, has been observed. There has been a shift in the start of the summer rains. This shift in the onset of the rains is highly significant as it translates into much pressure on the water sector to meet increasing demands of the agricultural, tourism, industrial and domestic sectors. The number of consecutive dry days is increasing while the number of rainy days is decreasing. The frequency of extreme weather events, heavy rains and storms of tropical cyclone strength or higher, has increased significantly over the last two decades. Analysis of data from Mauritius Meteorological Services does not show any increase in the number of storms in the SWIO tropical cyclone basin. However, a plot of the number of storm formations over the last 32 years (1975- 2008) clearly shows an increasing trend in the number of storms reaching tropical cyclone strength (winds above 165 km/hr). Furthermore, since the last decade observations indicate rapid or even explosive intensification of tropical storms. Climate change activities in the Republic have been consistent towards sustainable development goals. The concept of a sustainable island is clearly defined in the “Maurice Ile Durable” programme presented in Parliament in June 2008. Since then both public and private sectors are making efforts to integrate climate change in new developments strategies.